This paper presents the combustibility and thermal stability of an intumescent coating system, which incorporates rice husk ash (RHA) and eggshell as abundant by-products, with two other industrial fillers, namely TiO2 and Al(OH)3. Evaluation was performed using cone calorimeter test at 50 kW m−2 and TGA. 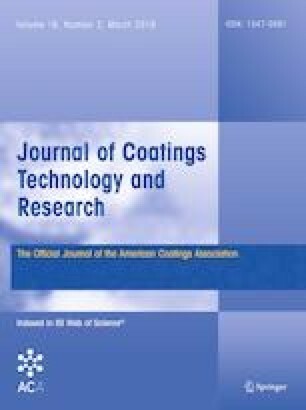 Experimental results indicated the influence of fillers on the combustibility properties of coating samples and the decomposition rate of coating materials. The TGA results demonstrated that the addition of RHA and eggshell results in the excess residue weight of more than 35% of the total weight loss. The cone calorimeter test results revealed the coating, which consists of TiO2 and RHA, exerts no effect on fire growth because no ignition is observed. The results proved a remarkable fire resistance of waterborne intumescent coating with the addition of RHA and TiO2 which (1) reduces the total heat release rate (HRR) and heat of combustion; (2) increases the carbon monoxide, carbon dioxide, and smoke yields; and (3) releases the lowest amount of gaseous oxygen released. Consequently, the appropriate combination of hybrid industrial fillers and biofillers has significant influence on the combustibility performance and decomposition of the intumescent coating system. This work was supported in part by the MyPhD (MoHE, Malaysia), University of Malaya, PPP Grant PG177-2015B and Fundamental Research Grant Scheme (FRGS) Grant FP050-2017A. All authors participated and discussed this work and contributed to the submitted and published manuscript.